Welcome to the Peninsula Reporter! The Peninsula Reporter is the official publication of the Homeowners Association at New Seabury! It reaches 100% of the homeowners in New Seabury via direct mail and on our website. It is published quarterly as the primary means of communication between the Peninsula Council and Homeowners. The four issues are published in February, May, August, and November. As a much sought after marketing vehicle, The Peninsula Reporter is supported entirely by the advertising it features. The Peninsula Reporter has been growing, now featuring more than 32 color pages, and we have added new features that we hope you will find enjoyable. New Seabury Notables is an article that showcases a New Seabury resident who has reached out to others and has given back to the community in some manner. We have some wonderful givers in New Seabury, and if you know of such a person, please contact us so that we can continue this series quarterly. We have featured a series on the history of New Seabury, compliments of our resident historian Rosemary Burns; Out on the Town highlights a local restaurant or activity, and homeowners who volunteer to write the review are given a small token of our gratitude for their participation. As always, we include ongoing information regarding the happenings in our town as well as articles of general interest to the community. 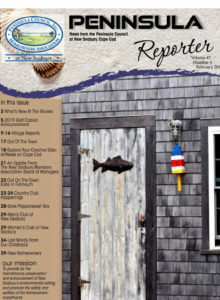 We also showcase regular reports from our President, Richard Noonan; Executive Director, Mike Richardson; Treasurer, Darlene Furbush; Special Maintenance Chair, Tom Caston; ARC Administrator, Tom Bone; individual Village Reports that are Village-specific; reports from both the Men’s Social Club at New Seabury and the Women’s Club of New Seabury, and a multitude of updates in a variety of areas. I encourage you to read The Reporter to stay up to date on the latest news concerning New Seabury, and to utilize this website to access past issues. The Peninsula Reporter is a great advertising vehicle for your business with broad reach to 100% of the Homeowners Association at New Seabury (over 1400 residents). It is the only advertising vehicle that can make that claim. It’s a great way to reach your New Seabury neighbors. If you are a current advertiser and would like to change text or photos in an existing ad, please send them by email to our printer LPi: adcopy@4lpi.com. You can submit photos to the Editor, Mary Jane Richardson, at pccomm@comcast.net.They will be used either in the Peninsula Reporter or on this website. Your comments, both positive and negative, are encouraged. It is constructive criticism which allows us to improve. We want to know what you think, and if there is something we can do to provide further information, let us know. We are happy to consider any suggestions. Send your comments to Mike Richardson at mike@peninsulacouncil.com and/or MJ Richardson at pccomm@comcast.net.